Fireworks may have ignited 78 Oahu fires on the Fourth of July alone, and firefighters were still extinguishing flames at several locations yesterday. "Any one of them could have damaged or burned up a home or could have seriously injured somebody," fire Capt. Kenison Tejada said about Independence Day fires lit by fireworks. The most serious was a brush fire that threatened five Makakilo homes, with flames coming right up to the walls at the edge of their backyards, he said. threatened any lives or structures. These were just two of 25 brush fires reported by 6:30 p.m. The total number of Fourth of July fires on Oahu dropped this year to 113 fires from 133 last year. But the Honolulu Fire Department could not provide an accurate tally of last year's fireworks-related incidents. On Kauai, firefighters may have prevented a brush fire from breaking out by stopping a small child playing with a sparkler in some tall grass, while his mother, cradling a baby, looked on. 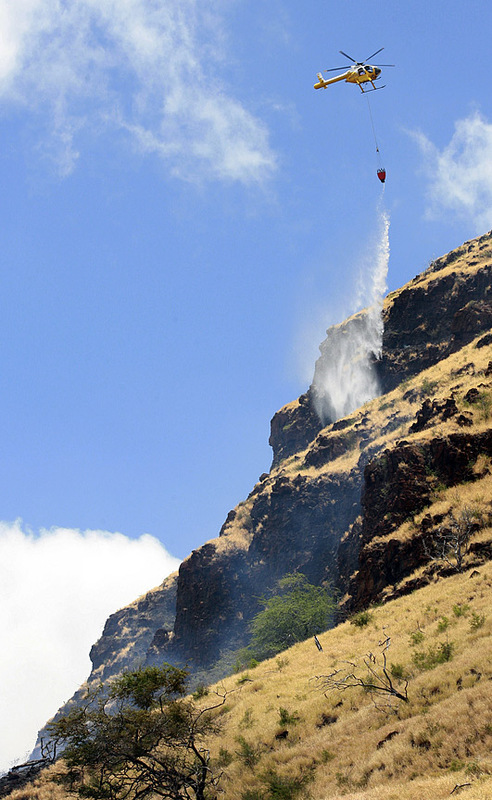 A firefighter sprayed water on the mountain side at Maili Point yesterday. The fire burned approximately eight acres and was one of three that broke out on the Waianae Coast yesterday. "That could have ended up catastrophic," said Battalion Chief Theodore "Teddy" Williams. 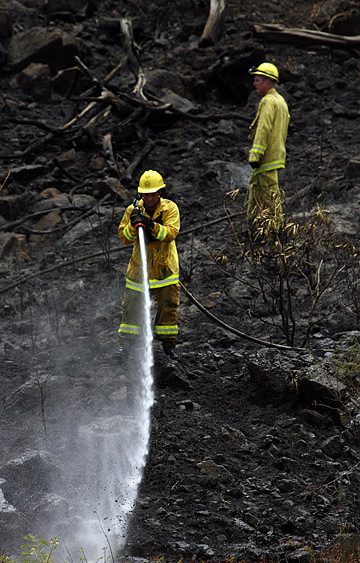 The firefighters, who had been battling a brush fire in Lumahai, were refilling their truck at Waipa Stream when they noticed the small child playing with a sparkler and standing head-high in grass. Firefighters called out to the child, then warned the woman and her child about the dangers of him playing with fireworks so close to dry brush. Williams said parents should be watching their children. "During the summer, when things are somewhat dry, it is especially important that caution is exercised when using fireworks, burning home or camp fires or when discarding a cigarette," Williams said in a news release. Kauai officials said six of eight brush fires may have been caused by fireworks between Monday and yesterday, with no major damage reported. Officials found evidence that fireworks had been used at a Hanamaulu brush fire. The Big Island reported 10 confirmed fireworks-related fires and two suspected fireworks incidents Monday through yesterday. That's comparable to 11 fireworks-related fires from July 2-5 last year. On Tuesday, Maui County firefighters responded to 22 alarms, six of which were fireworks-related, including three brush fires, a trash fire and two Dumpster fires. Yesterday, a brush fire, which began about 11:13 a.m., burned two acres, Battalion Chief Jeff Schaffer said. The case is being investigated. "We were pleasantly surprised we got out alive," Schaffer said. He said heavy rains earlier this year created more growth -- and more fuel -- but "the fuels weren't that dry." He also credits the department's efforts to educate the public. The Honolulu Fire Department continues to support a ban of consumer fireworks. "We have to advocate for the safety of our citizens," Tejada said.